To all the exposés coming out about Morris Dees & the Southern Poverty Law Center (SPLC), we should add that they spent a month specially training Israeli lawyer & rabid Zionist Nitsana Darshan-Leitner, the founder of Shurat HaDin law center which engages in “lawfare” against BDS groups & Palestinian solidarity around the world. Shurat HaDin uses the same methods as SPLC of litigating organizations out of existence. To my mind, we should not use the term ‘jihadi’ as it is used in ‘war on terror’ rhetoric unless we are mocking it. We should not legitimize its misuse & misappropriation in the service of vilifying Muslims or justifying war. 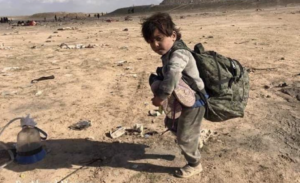 This Syrian child lost both his parents in US-coalition bombing in Baghouz under the guise of destroying ISIS. Still there are anti-Assad writers who call for ‘humanitarian intervention’ by the US to salvage the Syrian Arab Spring uprising. What do they not understand about counterrevolution in Syria, of which the US-coalition is fully a part? What do they not understand about US militarism & the so-called ‘war on terror’? If ISIS did not exist, the US would have to invent it to justify its barbarous wars. The only principled demands are for the immediate cessation of Syrian, Russian, & US-coalition bombing & the immediate, unconditional withdrawal of all foreign military forces from Syria. 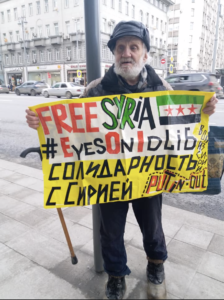 The Syrian Arab Spring uprising has supporters in Russia. And a tough-minded lot they are since criticizing Putin’s policies can get you a stretch in the gulag.